Some of my favorite kinds of stories are the ones that were "lost" to history. The true stories about people who did incredible things to shape our country or our world that aren't readily discussed in textbooks or in classrooms. These are the stories that were unearthed and given a new chance to be shared with the world, whether through films, books, or even music. One of these stories is a film called Hacksaw Ridge. Here's why you should watch it. I think the most incredible thing about Hacksaw Ridge is that it's based on true events. 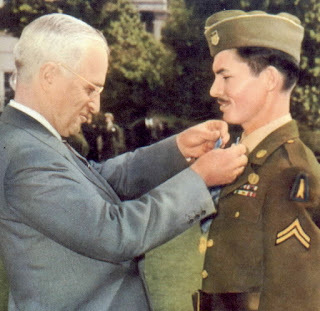 A man named Desmond Doss enlisted during World War II to become a combat medic despite his personal stance never to touch a gun, and he became the first conscientious objector to receive the Medal of Honor. Due to his efforts during the Battle of Okinawa, Doss rescued anywhere from fifty to one hundred soldiers without firing a single shot. These are the stories I love to learn about. More than that, the depiction of the Battle of Okinawa in this film made me understand the brutality of World War II in a way I had never experienced before. I've grown up learning about various wars America has fought in, but learning about it doesn't compare to seeing a depiction of it. I've seen other films that depict some aspects of war, but this story gripped me more than the others. It made me stop and think about what thousands of soldiers went through to fight for our country, our freedom. It's astounding. It doesn't hold back; it shows every side of the battle. I watched Hacksaw Ridge two weeks ago, and my thoughts still dwell on what those soldiers experienced. The story that is told is something worth watching, despite the gore of war that is shown. These events did happen. These soldiers did go through that experience. 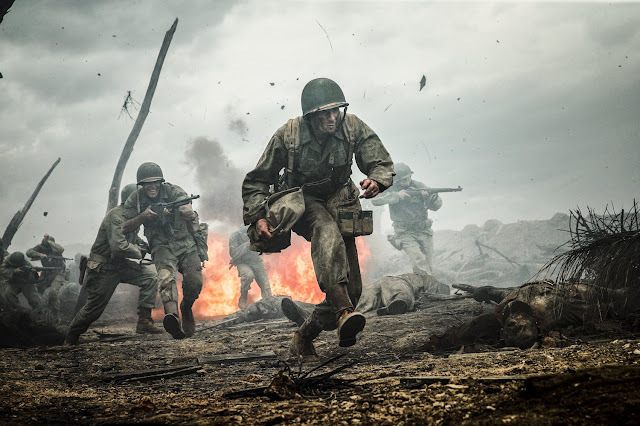 Maybe all the details of the film aren't 100% accurate (Mel Gibson, who directed the film, said they changed some aspects because he felt that viewers wouldn't even believe what had truly happened to Doss and the others in his platoon), but the overall depiction of the film relays the horror of that battle. 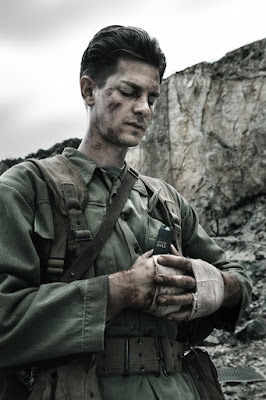 Despite Hacksaw Ridge being rated R for its intense and realistic portrayal of war, I think it's worth watching (if you are comfortable with the depictions of war and gore) in order to experience the heroic and courageous story of Desmond Doss. The cast of Hacksaw Ridge is made up of a wide variety of well-known actors and new actors. And it works. Each member of the cast did absolutely splendid in their part. Hugo Weaving was phenomenal as Doss' father, who suffered from PTSD and alcoholism as result of being a WWI veteran. 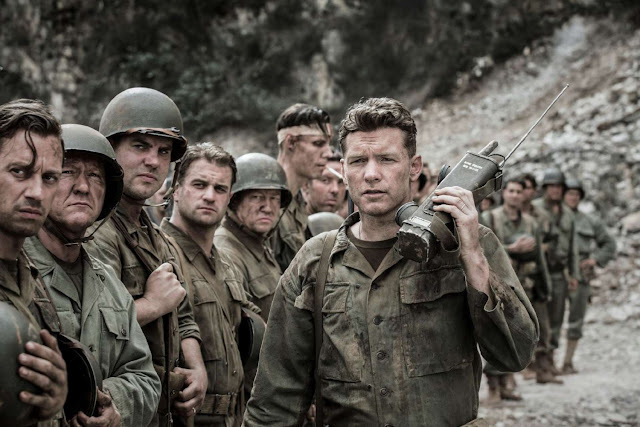 Sam Worthington and Vince Vaughn both surprised me with their ability to come across as strong and rigid army officers. Even Luke Bracey, a fellow soldier, and Teresa Palmer, Doss' wife, were perfectly cast for the parts. The real star, of course, is Andrew Garfield, who played Doss. I've seen Garfield in several other works, but this one is the best. He truly showed his gift of acting in his portrayal of Doss. Never once during the film did I think he was recycling actions from one of his other characters. He was completely, utterly the character he was cast to play. And he did it in a way that was believable and moving. I was thoroughly impressed with his acting ability, and he deserves all the recognition for it (and he probably deserved that Oscar as well, but I'm trying not to be too bitter). Most importantly, Hacksaw Ridge is a movie that inspires you. It's about one man and his fortitude about his personal beliefs and faith. Yes, Desmond Doss was a Seventh-day Adventist Christian, so the movie does discuss God and the Bible. But it doesn't do it in a way that is overbearing or preachy. It's not a movie where his entire platoon and commanding officers turn to Christ and change their ways in a cliche moment. It's real faith lived out. Doss, on his own, chose to stand up for his personal beliefs despite what his commanding officers ordered, what the other soldiers in his platoon said and did to him, and the dangers he put himself and others in during the Battle of Okinawa. He did not back down because he believed that God was telling him not not to commit violence against another human and not to touch a gun. The film's message isn't about being a pacifist or saying that killing for war is a sin; it's simply a story about a man standing up for his faith. And that, I think, is important for any person, no matter their age, gender, religion, or place in life, to remember. It's inspiring to see someone stand up for what they believe and then in turn do incredible things with his faith. Overall, I recommend Hacksaw Ridge to anybody that can handle watching a film that depicts war in a brutal yet realistic manner. I myself do not like gory films, and while my stomach was roiling at what I watched, I believe it was worth every moment to learn about this amazing story about what one man did to save lives despite what everybody was telling him otherwise. What is your favorite film or book based on a true story? This movie was so difficult to watch, even as someone who LOVES military history, but I wholeheartedly agree with the importance of stories like this. There's nothing I love more than stories about the people on the ground actually doing the fighting (or in Doss' case, the saving), showing their physical and personal battles and not just the politicians making decisions far away. Thanks for sharing your thoughts! For anyone interested in some of the "forgotten" stories of war depicting ordinary people and not just famous generals/kings/presidents, I'd recommend The Pacific, an HBO miniseries that I think captured the brutality and humanity and horror and love in the Pacific Theater of Operations exceptionally well (and which follows several groups of characters, giving it a wide perspective). 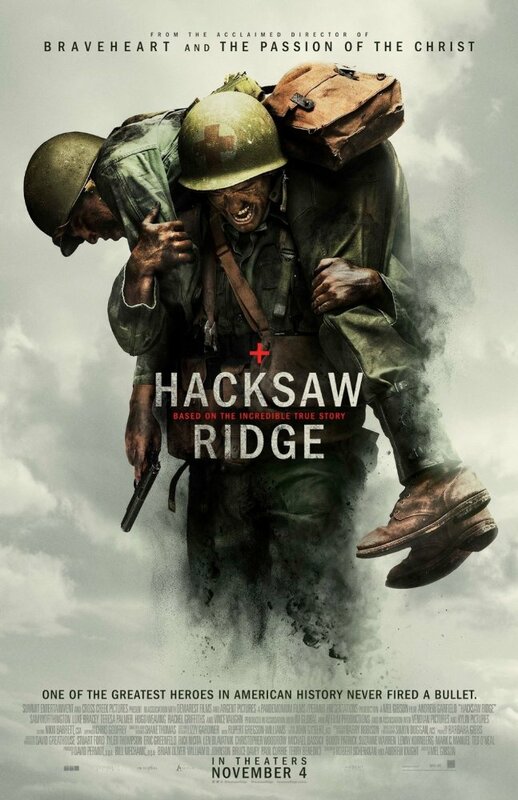 It's pretty high on the gore/violence level, but not quite as bad as Hacksaw Ridge!